From the moment you arrive, savor the breathtaking views of the golden sands, crystal blue waters and incredible sunsets. 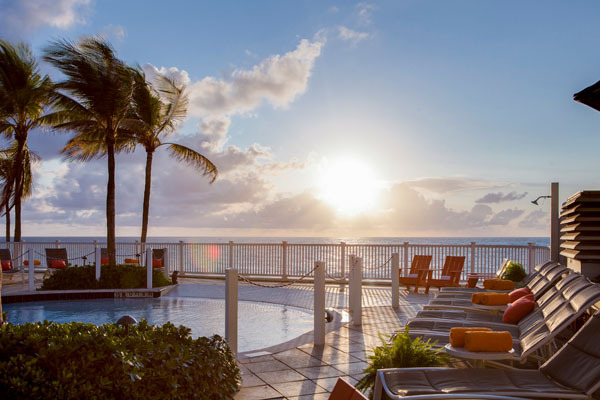 Sitting right on the Atlantic Ocean, this Florida beach resort features a beautiful zero entry pool, Fort Lauderdale’s only Lazy River and private beach. 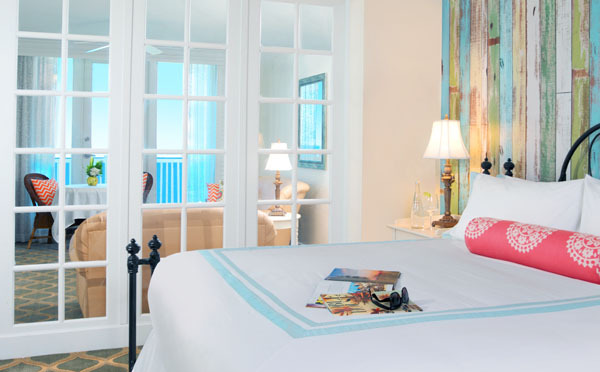 Wake up to waves crashing every morning in one of the 106 oceanfront suites, complete with balconies for those unforgettable sunrises and sunsets. Choose from two queen, king and premium ocean front king suites all equipped with televisions, mini refrigerators and coffee maker, high speed internet and available in-room movies, games and music. 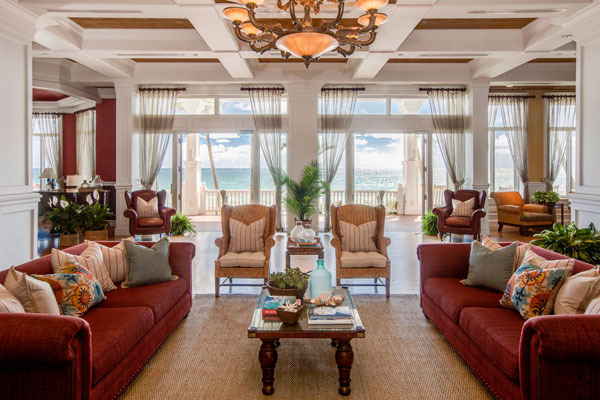 To enhance your luxury beach experience, the premium oceanfront king suite is accompanied by premier beach service, which includes the arrangement of lounge chairs, towels, an umbrella and bottled water, to make your beach days just that more relaxing. The 11-story tropical building boasts its pale yellow color with blue and white striped awnings to evoke a Caribbean appeal, with a touch of elegance. The lobby greets guests with paintings of palm-lined Florida landscapes to ensure you are immersed in the setting before even reaching your room. The marble floors glow when the sunlight shines in, creating an atmosphere that is unmatched in luxury and relaxation. Guests can choose to relax by the beachfront zero entry pool or let the currents of the lazy river tubing ride push you along while you relax taking in the views of the coastal-chic waterfront retreat. For those looking for complete relaxation, the PURE Spa is where Scandinavia meets Florida to bring guests the Scandinavian feeling of well-being in Florida. The Atlantic Ocean becomes the unobstructed backdrop as you sit back and unwind with a Swedish massage designed to decompress. The hot stone massage is a complete therapy for those seeking deeper relaxation. If you prefer to stay in your room, a masseuse will come to your room and you can enjoy a relaxing massage in your room or on your private balcony with the same Atlantic views. Boost your glow, with a skin treatment or vitamin c boosting facial perfect for re-energizing and rejuvenating. The Oceanfront fitness center is also accessible to all guests who like to keep in shape while on vacation and is equipped with all the latest technology and equipment. If this time around you brought your work with you, there is over 7,000 square feet of meeting and banquet space, perfect for business functions, events and social gatherings. Choose from unique indoor and outdoor venues equipped with state-of-the-art audiovisual equipment. OCEAN2000 is the Pelican Grand Beach Resort’s latest waterfront restaurant boasting new American fare, and offers diners an alternative to the other upscale Fort Lauderdale restaurants. OCEAN2000 pays homage to the local food ways, devoting itself to the fine combination of great mixology, good times and superior regional cooking. Diners will indulge in delectable starters such as blue crab cake, spicy tuna tartare or Florida conch chowder with Yukon gold potato and sour cream. From the ocean, only the freshest and best seafood is served. The seafood mushroom risotto with Florida lobster, scallops, shrimp and fresh black truffle is a crowd pleaser, as well as the maple and guava BBQ-glazed salmon with sweet potato. If seafood is not on your mind, opt in for the roasted organic chicken or blue cheese-crusted filet mignon. Chilled seafood is also available and includes east coast oysters, jumbo shrimp, lump crab cocktail and you can build your own local-favorite seafood platter to really appreciate Florida’s waters. Enjoy the view with libations and light fare at one of the best Fort Lauderdale bars—O2K Lounge. This is the perfect place to enjoy a cocktail or two while overlooking the scenic tropical pool and Atlantic Ocean. Guests can indulge in tapas or chilled seafood at the bar or by the pool, while sipping on crafty cocktails such as Hemingway Papa Doble, Dragonberry Mojito or a Sunset Grand Margarita. With the Florida sun shining down on you, temperatures can rise, and The Emporium is the ideal place to cool off with some old fashioned ice cream that will delight the kid in all of us. They also offer an array of coffee treats, gourmet bakery items and some neat gift items for the ones who couldn’t make it to this oasis with you.